Director/Writer: Matt Frame / Cast: Dave Peniuk, Angela Galanopoulos, Darren Andrichuk, Emma Docker, Chris Allen, Starslie Waschuk, Terry Mullett, Cynthia Chalmers, Gerald Varga, Hans Potter, Katherine Alpen, Andrea Bang, Niall King, Jason Asuncion. 80s homages are everywhere right now, from Stranger Things to Summer of 84, and the slasher movie has been no exception. This parody recalls the likes of Student Bodies, Pandemonium, and National Lampoon’s Class Reunion. And like those movies, it’s catered to a particular taste. 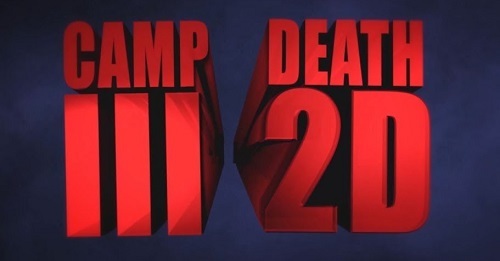 For a lot of its 85-minute runtime, Camp Death III in 2D plays out like a Benny Hill skit, with characters zipping all over the place at increased walking pace. Though I grew tired of this long before the end, fortunately the production qualities of this $35,000 CAD movie are comparably high and there are just about enough decent gags for a once over, but, as with any parody, an equal distribution of terrible ones as well. 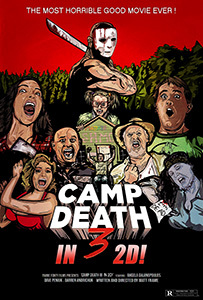 Camp Crystal Meph is being reopened three years after the last in a never ending series of murders courtesy of Johann Van Damme, the off-the-shelf masked loon with Mommy issues. Hopeless optimist Todd Boogjumper has opted to open it to a group of outcasts and misfits, much to the chagrin of his ever-furious profanity-spouting uncle Melvin. Naturally, Johann rocks up and begins eliminating the campers stabbing them, burning them, or, in one pretty funny scene, using a toaster to bombard them with slices of cooked bread. Some campers are dumb enough to accidentally off themselves or each other as well. Most of the cast members are listed as coming up with ‘story ideas’, which lends to the uneven comedy throughout – it’s more like a series of skits by a comedy troupe loosely strung together by occurring at the same location, and not all jokes relate to Friday the 13th lore or basic slasher movies clichés. By the end things have gotten really wacky, with a Santa costume, a talking head on a drone, and the most annoying thing ever – a microphone too close to an amplifier. Entirely down to any individual sense of humour but worth a once over. That’s very generous Mr. Hud. Hahaha.